These info cards have a short description and brief directions on how to use each item in the box. They're a lifesaver because almost everything on the product packaging except the name is in a foreign language. So if you don't know how to read the language and the title's not self-explanatory, this card saves you a lot of time searching for directions online. 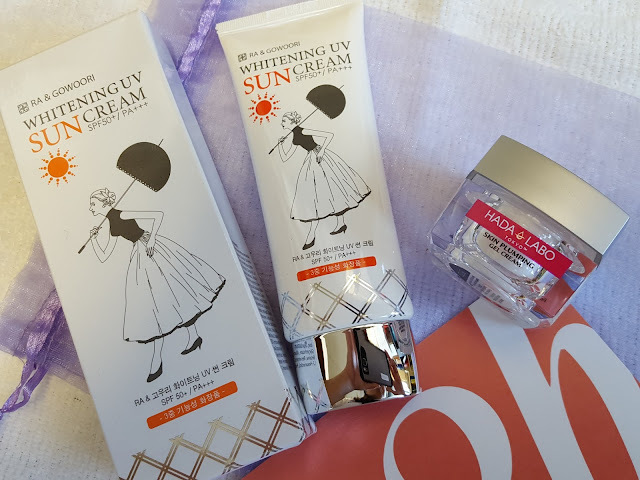 Ra & Gowoori Whitening UV Sun Cream SPF 50+/PA+++ - Getting a sunscreen in a winter box might seem kind of strange, but sun protection is super important year-round. 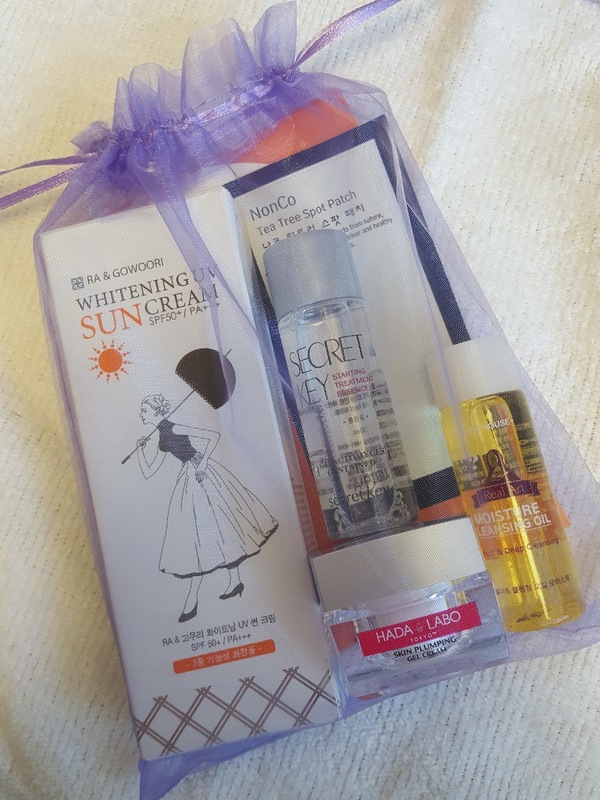 Its addition to this month's box reminds us that even if the sun's not beaming you still need to protect yourself from its rays; even though you don't feel 'em they're still there! 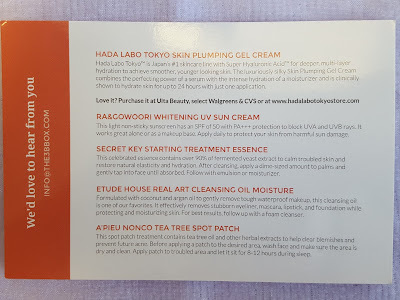 Hada Labo Tokyo Skin Plumping Gel Cream - I've grown to love gel creams because they tend to sink in quicker than other facial creams and don't leave my face feeling sticky. This one is from Japan and contains Hada Labo's trademark ingredient Super Hyaluronic Acid which has twice the moisture retention capacity as regular hyaluronic acid. And good news: if you love it, you don't have to pay outrageous shipping fees to get more because this cream is available at Ulta and Walgreens! Etude House Real Art Moisture Cleansing Oil - I'm so excited to see this in here. I've never used a cleansing oil before but hear lots of great things about it. It works to remove makeup and impurities by using "good" oils to remove the "bad" oils (like sebum) based on the basic chemistry principle that "like dissolves like." Cleansing oils are great for all skin types, even oily skin and those prone to acne since it doesn't actually stay on your skin for longer than a few minutes. Can't wait to try this! A'Pieu Nonco Tea Tree Spot Patch - This skinny foil has 12 patches of varying sizes (between 0.5-1 cm in diameter) to cover whatever blemish you have. Each patch contains tea tree oil which has antimicrobial properties and is effective against acne. Contrary to what I expected, there's no moisture in here - in fact it's like a clear sticker that you stick on your face overnight. In the morning I saw no blemish relief after the recommended 8 hours of wear but I'd be crazy to expect a change overnight, right? Maybe two days will do the trick? Overall I'd say this was a great intro box to Asian skincare. Last month we got a toner, emulsion and serum; this month there's a cleansing oil, essence, and moisturizer. If you want to start building a complete skincare regimen, 3b is a great place to start. Click here to get on the wait list. It took several months for me to get off, but it's totally worth it! Note: All opinions expressed in this review are my own. Post does not contain any referral links. 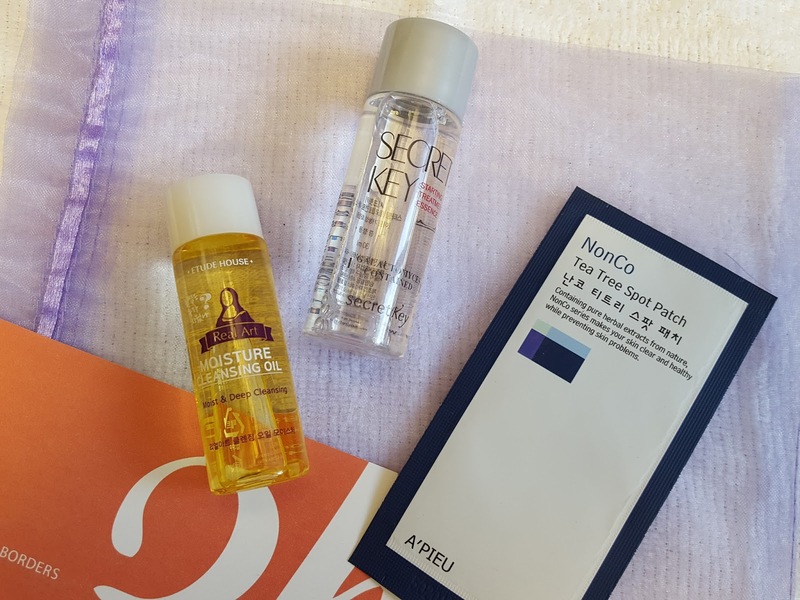 A-TRUE: Korean Skincare - Sampler Haul Review! !